Page from Jyōti (Annual), Madras : Jyōti. 1972. From the University of Chicago Library. Jyoti, meaning “light”, is the title of a long-running Telugu-language periodical. Based on the volumes I skimmed, it seems that the team in charge of producing the magazine took incredible care to include gorgeous custom title treatments and illustrations for each article. Here is one such example, found in the 1972 Deepavali special issue. 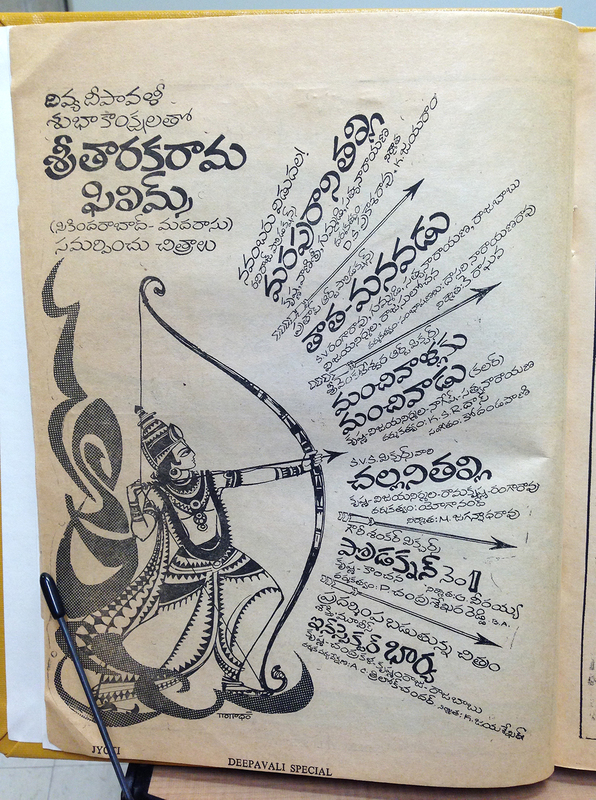 An illustration of Rama, armed with a taut bow, is surrounded by rays of Telugu text. From what I understand, the top left “title” reads: శ్రీ తారకరామ ఫిలిమ్స్ Sri Tarakaram Films. I imagine that this refers to the Actor/Director/Producer/Politician, Nandamuri Taraka Rama Rao. But I could be wrong! Anyway, we’re here to look at the writing! This was a very popular lettering style in the late 60s/early 70s, from what I’ve observed. The simplified tick marks, small closed counters, generous round shapes, and tight spacing. If anyone has any other information about this ad, the lettering, or Jyoti magazine, please feel free to comment! Thank you for your participation!